They sure like to make things interesting. 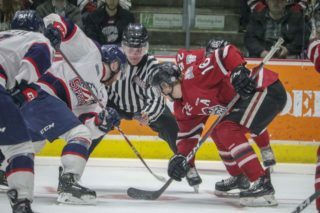 With rookie goaltender Bradley Van Schubert holding down the crease, the Guelph Storm (23-15-2-1) bursted out with three third period goals to break a tie and defeat the Kitchener Rangers (16-14-2-6) 4-2 Sunday night at the Sleeman Centre. Zac Leslie, James McEwan, C.J. Garcia and Tyler Bertuzzi all scored while Van Schubert turned in a stellar performance with 32 saves with first star honours in the win. 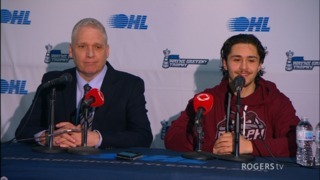 The win was the 6’2″, 200 lbs goaltender’s first in the OHL, but he looked like a veteran with many victories on his belt with his calm play and timely saves. For Kitchener, David Miller and Brandon Robinson tallied goals while Jake Paterson stopped 28 shots. The Storm, playing their final game of a 3-in-3 weekend, came into tonight’s game facing a Rangers team that ranked third-last in winning percentage on the road in the Western Conference (.441%). In addition, the Highway 7 rivals have scored the lowest amount of goals on the road (48) in the West. The game began with both teams trading early power play goals. At the tail-end of their first power play and 8:08 of the opening frame, Miller received a pass from Mike Davies in the slot and beat Van Schubert with a blocker-side wrist shot. The Barrie, Ontario native goaltender could not get enough of the shot off his blocker as the Rangers jumped out to a 1-0 lead. Only 1:37 later and on a power play of their own, Leslie fired a shot from the top of the zone that deflected off a Rangers defenceman and fooled Paterson to tie the game. Jason Dickinson (six games) and Bertuzzi (four games) both extended their current point streaks by assisting on the goal. The rest of the period played out as one would expect in a division game: fast-paced hockey with each team consistently exchanging scoring chances. The Storm led 12-5 in shots after 20 minutes. The first-year Van Schubert became busier in the second period. He was tested with a number of quality shots but stopped all 11 faced in the middle frame. Despite two power plays for the Rangers and one for the Storm, neither team could break the tie and take the lead as a physical second period ended with the same score on the board. Guelph continued to outshoot Kitchener, leading 24-16 on the shot board after two. In terms of scoring, the third period was a different story. 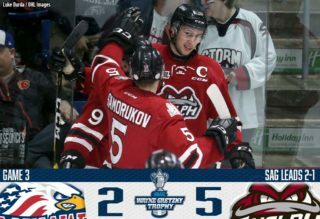 The Storm, who have had more goals in third periods (44) than in any other period this season heading into the game, continued the trend. McEwan broke the tie when he skated down the left side and shot a laser of a wrist shot that beat Paterson short-side. The goal was McEwan’s second of the season and first in 11 games. Newly acquired defenceman C.J. Garcia scored his first goal as a member of the Storm 2:19 later. Garcia found himself with the puck at the blueline and unleashed a shot that snuck low past Paterson. 19 seconds later, the offensive burst continued. A streaking Bertuzzi fired home a perfectly-placed short-side shot that hit the crossbar before crossing the line and giving Guelph a 4-1 lead. 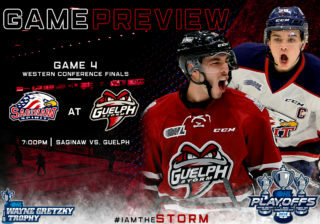 The Rangers’ Robinson would pot a late tally, but the Storm’s three-goal eruption was too much as Guelph evened the season series with a 4-2 triumph. The win improved the Storm to 13-6-2-0 at home and dropped the Rangers to 5-8-1-4. Guelph is back in action on Friday, January 16 when they visit Sault Ste Marie for a 7:07 PM start. They are back home at the Sleeman Centre on Sunday, January 18 when they welcome the Kingston Frontenacs at 6:30 PM. 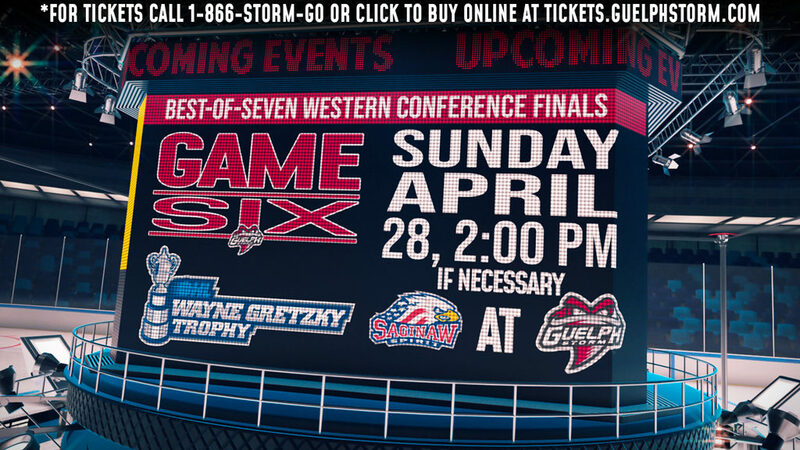 – The Storm have won the last 6 regular season games in Guelph vs. Kitchener. In those games, they shut the Rangers out 3 times and have held them to just 8 goals. – This was the 4th of 8 meetings between the Highway 7 rivals this season. The season series is tied 2-2. – Tonight’s game was the final of a 3-in-3 weekend for the Storm, going 1-1-1 on the weekend. – Rookie goaltender Bradley Van Schubert recorded his 1st career OHL win. 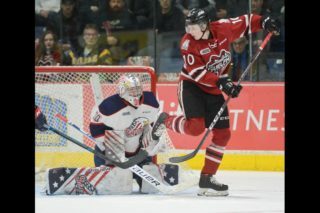 – Storm forward Pius Suter played in his 100th career OHL game. – Captain Jason Dickinson extended his point streak to 6 games (3+5=8). – Tyler Bertuzzi now has points in 4 straight games, amassing 7 points (3+4=7) in that span. – Noah Carroll, Robby Fabbri, Austin Hall, and Chris Marchese remained out of the lineup with injuries. 1st Period-1, Kitchener, Miller 14 (Davies, Schmidt), 8:08 (PP). 2, Guelph, Leslie 6 (Bertuzzi, Dickinson), 9:45 (PP). Penalties-Baltisberger Gue (high sticking), 6:16; Blaisdell Kit (holding), 8:44; Maaskant Kit (interference), 15:31. 2nd Period– No Scoring.Penalties-Robinson Kit (inter. on goaltender), 7:33; Robinson Kit (check from behind), 15:04; Smith Gue (high sticking), 18:29. 3rd Period-3, Guelph, McEwan 2 (Cairns, Hotchkiss), 3:21. 4, Guelph, Garcia 4 (Dickinson), 5:40. 5, Guelph, Bertuzzi 25 (Garcia), 5:49. 6, Kitchener, Robinson 12 (Iafrate, Hora), 19:10 (PP). Penalties-Suter Gue (interference), 7:23; Iafrate Kit (inter. on goaltender), 13:57; Baltisberger Gue (tripping), 18:04; Dickinson Gue (boarding), 18:30. Shots on Goal-Kitchener 5-11-18-34. Guelph 12-12-8-32. Power Play Opportunities-Kitchener 2 / 5; Guelph 1 / 5. Goalies-Kitchener, Paterson 13-11-0-1 (32 shots-28 saves). Guelph, Van Schubert 0-3-0-0 (34 shots-32 saves). Referees-Keith Kaval (14), Andrew Thompson (36).